TeamSnap is made up of a distributed team, meaning we have employees all over the United States (and one each in Canada, Croatia and Australia!). As part of our culture of personal responsibility and accountability, our team members work however they feel most productive — from coffee shops, in home offices, at coworking spaces, standing on their heads. Pretty cool, right? You should think about joining us. With this flexible culture, any day can become Casual Friday, Bring Your Kid to Work Day or Puppies in the Office Day. We spend a lot of time with our furry friends during the workday, as well as sharing pet photos and stories (in fact, one TeamSnapper rigged up a Google Hangout session so we could see what was going on with her pet bird! ), and we wanted to share them with you as well. From our home team to yours, here’s a collection of the extended TeamSnap family. The original TeamSnap mascot is Keeva, Sales Manager Abe Bergan’s buddy. Keeva serves as the TeamSnap HQ Social Liaison. Between ensuring that all visitors to the office are well attended to with gratuitous requests for petting, Keeva is also responsible for heading up the growing contingent of canine sports that uses TeamSnap (they’re still working out the opposable thumbs issue). Beth Hazen, TeamSnap technical account manager, says this picture of Bogey captures the lab/beagle mix doing what he does best. He does do some tricks though, including speak, sit, shake, “bang” (play dead), sit pretty, and roll over. He can also howl like no other. Bridget Sweeney, TeamSnap’s office manager, says border collie/catahoula leopard dog mix Stella loves to hike. In fact, this photo was chosen by Outside Magazine for the Top 25 of about 800 submissions of #AdventureCompanion photos. Stella placed No. 18! Bridget says even though Stella loves to hike, she also likes to snooze. A lot. Andrew Berkowitz, chief product officer, says Lola (pictured here) and Widget are his product management cats, and they make most of the decisions around here. In fact, they have obviously done such a good job that they spend most of the time reclining, watching the fruits of their good work. 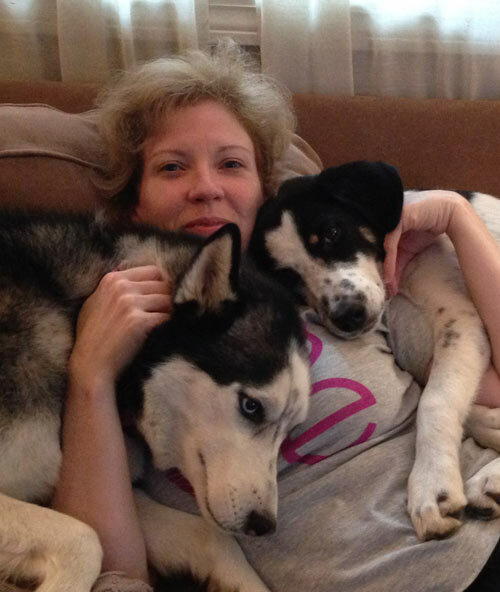 QA Tester Jennie Neusch shares a little quality time with her pups. Andrew Berkowitz, chief product officer, says Lola and Widget (pictured here) are his product management cats, and they make most of the decisions around here. In fact, they have obviously done such a good job that they spend most of the time reclining, watching the fruits of their good work. Dave DuPont, TeamSnap CEO, says his dog Basil is his rival for his wife’s attention. By the look of this picture, Dave might be losing! Stephanie Myers, TeamSnap’s content manager and resident cat lady, has yet to lose a game to kitty Chica. Bridget Sweeney, TeamSnap’s office manager, says border collie/catahoula leopard dog mix Stella is the best adventure companion. Stella was found in Alabama after having been orphaned by a tornado in March 2011, and Bridget adopted her in July of that year when she was about 4 months old. QA Tester Bria Jones has a full house with kitty Whiskers and 3-year-old pit mix rescue Dizzy and 6-month-old mystery breed puppy Bandit (not pictured). Whiskers was taken in by Bria’s son in a Utah Walmart parking lot where another little boy was giving the kitten away. Luckily, Whiskers thinks he’s a dog, so he holds his own playing and wrestling with the pups. QA Tester Bria Jones has a full house with kitty Whiskers (not pictured) and 3-year-old pit mix rescue Dizzy and 6-month-old mystery breed puppy Bandit, who was rescued after a friend saw the pup being thrown from a moving vehicle! Luckily, Bandit got away with just a bump on the head and is with a much more loving family now. Partner Relationships Manager Evan Williams says Cal Ripken was one of his biggest baseball idols as a kid. So much so that he chose to name is 1.5-year-old Doberman Pinscher rescue Ripken. She goes by Kens for short and loves to run, hike, ride in Evan’s truck, show off her off-leash obedience, and she is currently learning to fetch Evan beer from the fridge. Junior Ruby Developer Michelle Muranaka’s dog Rita is a half Vizsla, half Shar Pei mix straight from the streets of Austin, TX. She enjoys burrowing in blankets and hates when humans dance in her vicinity. When not performing cat yoga, pictured here, Miss Mittens is usually cuddled up in the lap of Stephanie Myers, TeamSnap’s content manager, while she works. Shane Emmons, TeamSnap senior developer, describes Ruby and Penny as “some of the world’s laziest animals. They’re also not the sharpest tools in the shed.” They’re cute though! Jen Steinker’s pup Kona is a lover of all things sports, especially the water-based ones. He enjoys long walk/runs, sailing, hanging at the softball field and running free on the closed golf course. His favorite activity is visiting the Dog Beach, Huntington Beach, CA, a mile-long stretch of beach where dogs can roam off leash. Archie is Head of DogOps at TeamSnap. His primary duties are to assist his human (Mark Cornick, lead ops engineer) with essential things like taking breaks, and to act as a watchdog by barking loudly whenever the mailman comes to the door. He also helps with document management by occasionally chewing up anything that might have inadvertently been left on the floor. Most importantly, he provides companionship to Mark and his wife Jen, both of whom work mostly at home these days. Beans is a ball of endless Aussie energy with a special love for sticks, frisbees & neck massages. At 12 years old, he plays as hard now as he did at 2, and human pal Roxy Sears, a member of the TeamSnap sales team, gets tired just watching him go. Roxy also wishes he could reciprocate the neck massages. Goose is the cat companion of Developer Evangelist Zach Gardner. Goose has been known to sit in on Google Hangout sessions and clearly has a knack for blending in with his surroundings. This is the normal workday view for Jenn Southan, director of customer experience. Molly and Chrissy are never very far apart — and never far from Jenn’s feet while she’s working! Molly is a sweet, quiet and gentle 8-year-old labradoodle who loves to lay around and be pet all day long, unless she finds a critter in the back yard. Then she will dig until she reaches China to find it. Chrissy is a 6-year-old Lab mix with a goofy, happy-go-lucky and friendly personality. She makes a great goalkeeper for the soccer-playing Southan kids and they are often seen out back with her, practicing against the best defender in the house. Strategic Product Manager Sam Player’s cat Jade does not seem to understand this work from home thing. Developer Skyler Seamans and his wife have two rescue dogs, Bella and Bandit. Bella is a white German Shepherd mix who loves to cuddle and is extremely friendly. She enjoys chasing squirrels and de-stuffing toys. Bandit is a DDR German Shepherd (East German Shepherd) who had a rough life before they got him. It took over a year for him to adjust to his new comfortable life, but he loves it and is settling in well. He loves to play fetch or frisbee and will tolerate short periods of cuddling in exchange for a good ear scratch. Android Developer Annmarie Ziegler’s Solomon Island Eclectus, Kirby, is the one outlier to our “Four-Legged Family” post. Annmarie has been known to feature Kirby on Google Hangout sessions. Android Developer Annmarie Ziegle’s Boxer Phoebe poses with a doppelganger. 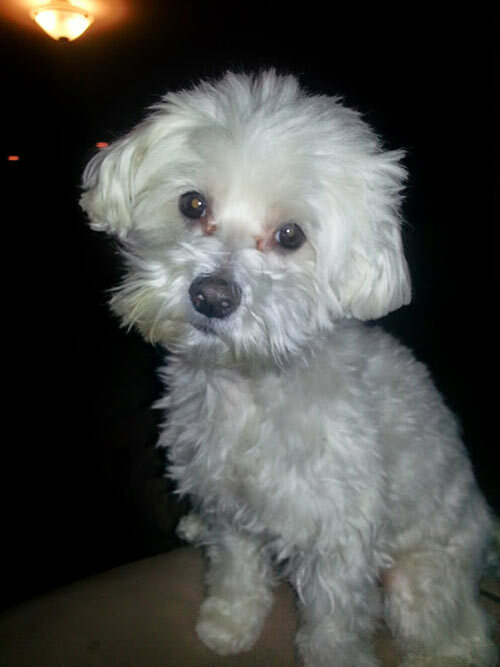 Partner Relationships Manager Evan Williams’s Maltese Goose might look like a pup but acts like a human. Partner Relationships Manager Evan Williams’s 4-pound Yorkie Guinness is all tongue and ears but thinks he’s the same size as Evan’s Doberman! Guinness is the real boss of the house. Android Developer Hunter Pryor’s pups Moby (left) and Jasmine (right) are both shelter dogs who love going on walks and destroying stuffed squirrels. Ruby developer Dan Matthews is kept company during the workday by Kieran (right) and Nellie, his shepherd mix rescues. Stephanie Myers is the Content Manager for TeamSnap, managing such content as this blog, the TeamSnap newsletter and much more. When she’s not being the boss of content, you can find Stephanie playing beer-league softball or competitive skee-ball in Austin, Texas. Where in the World Are TeamSnap Employees?